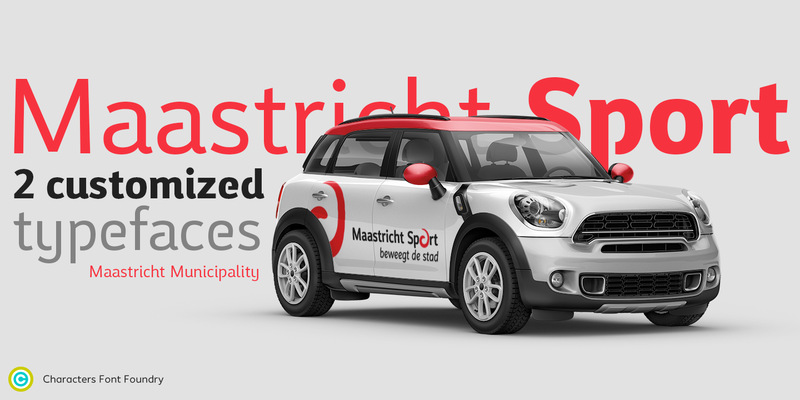 CFF Maastricht Sport is a suit of retail & customized fonts for the Maastricht Municipality, department Maastricht Sport. They asked our help to refresh their corporate typography. When organizations reposition or restructure they often reflect on their current identity, corporate design and market position. This was also the case with Maastricht Sport. For them, to a repositioning belongs a powerful USP; brand typography. We couldn’t agree more. After weighing the option of custom- vs modified type, they choose CFF Insider Pro font family as the basis for their identity. They licensed the complete family and we customized two fonts to fit their needs. Maastricht is not just a beautiful town, it’s also our home town. It is believed to be the oldest city in The Netherlands and has great appeal, not only for day trippers and tourists, but also for (new) residents. This can be seen in the city’s wonderful nicknames, such as the “Culinary capital of The Netherlands” and “Europe’s smallest metropolis.” Creating a custom typeface for them made us humble and respectful in the face of this impressive history. In the decision process we considered using CFF Nordic Narrow, CFF Jekyll Pro and CFF Insider Pro. They instantly fell in love the CFF Insider Pro family. “It’s versatile, legible and distinctive. It will stand out from the competition.” Maastricht Sport decided to buy a corporate license for the whole organization so all the employees now works with Insider Pro to ensure a coherent brand appearance. Supplementary to the CFF Insider Pro font family we created two special fonts for them based on the existing ‘Regular Sport’ and ‘Bold Sport’. We lovingly called them ‘fun fonts’. When we originally designed CFF Insider Pro in 2004 we already had an idea for an alternative version, but never found the time to release it. These idea proved to be so strong that we could use it as a starting point for this project. So we customized both fonts to give them even more power and personality. The client uses these ‘fun fonts’ to create eye-catching marketing materials with a strong focus on typography. We started spicing up the words most used in their communication to see if this leads to enough distinctiveness. Opening up the letters gives the Insider Pro fonts lots of personality, especially in large sizes. The little serifs add to the reading rhythm and set apart the normal- from the customized Insider fonts even more. The Gemeente Maastricht Sport fonts work extremely well in large sizes. Since capitals have not that many curves and details to play with, it was hard to redesign them without detaching them to much from the origin. Working with Mireille Caubo and Gusta Wynans was a great joy. They were so enthusiastic about the project and were very aware of the long term advantages of having an own corporate typeface. Their inspiring way of working brought a positive flow into the project which helped a lot with finding the right solution for their needs. “For several months now, Ive been working as a graphic designer at Maastricht Sport with our “own” typeface, developed by René Verkaart. That’s a fantastic experience for me. Apart from the fact that it is a beautiful font, it makes a major contribution to the layout and recognizability of the corporate style. I would recommend a personal font to any organization. As an organization, you can create a difference in the big gray mass with your own font. It greatly enhances the branding and makes designs on a number of fronts easier. That’s how I experience it. CFF Maastricht Sport is a proprietary typeface that will not be made available for sale. But you can buy the retail fonts on MyFonts.